Dr. van‘t Veer is a world renowned Molecular Biologist and inventor of MammaPrint®. Dr. van 't Veer's research focuses on personalized medicine, to advance patient management based on knowledge of the genetic make-up of the tumor as well as the genetic make-up of the patient. Dr. van ‘t Veer is the Biomarker Committee Chair for the Foundation of NIH sponsored multicenter adaptive clinical trial I-SPY 2, overseeing the processes for FDA-IDE biomarker usage and qualifying biomarker companion diagnostic testing. She served 2010-2014 as Board member of the American Association of Cancer Research. She has over 230 peer-reviewed scientific articles and is co-inventor of 6 patents. 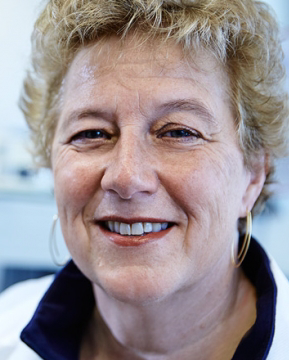 Dr. van't Veer received the 2007 European Society of Medical Oncology (ESMO) life-time achievement award for translational research in breast cancer and the prestigious European Union Women Innovator Award, 2nd prize in 2014. Dr. van‘t Veer received undergraduate training in biology and a master of science in molecular oncology (1984) at the University of Amsterdam in the Netherlands. She earned her PhD in Medicine for a dissertation on oncogene activation and tumorigenesis in 1989 at the University of Leiden. She then completed two postdoctoral fellowships, first at the Cancer Center of Harvard Medical School and Massachusetts General Hospital in Boston (1989-1991), followed by the Division of Molecular Carcinogenesis at The Netherlands Cancer Institute (1992-1993). She then joined The Netherlands Cancer Institute as a Molecular Biologist in the Department of Pathology. At the institute, she assumed increasing responsibilities, starting with the initiation and leadership of the Departments of Molecular Pathology and Genetic Counseling, culminating with her appointment as the Head of Diagnostic Oncology, overseeing the clinical work and associated research. In 2003 she was one of the founders of the Netherlands Cancer Institute spin-off, the molecular profiling company Agendia. Concurrent to her employment at The Netherlands Cancer Institute Dr. van‘t Veer served as the Chief Operating Officer from 2002-2007 and as the Chief Research Officer from 2007-2014 for Agenda NV, a company she founded in Amsterdam to make her scientific discoveries available to clinicians for patient use. MammaPrint® obtained the first FDA 510K ‘In Vitro Diagnostic Multigene Index Assay’ (IVDMIA) clearance in 2007, and is included in several international and national guidelines for breast cancer management.After a 2008-2009 appointment as Visiting Associate Professor at the UCSF Helen Diller Family Cancer Center, Dr. van ‘t Veer moved to UCSF as Professor of Laboratory Medicine in 2010 and assumed leadership of the Bay Area Breast Cancer SPORE and the BOP. In 2011 she assumed leadership of the Athena Breast Health Network at UCSF. She holds the Angela and Shu Kai Chan Endowed Chair in Cancer Research. She has established at UCSF a Laboratory for Applied Genomics that is CLIA licensed and provides a robust infrastructure and testing incubator lab for new molecular diagnostics of cancer.